If you’re missing more than tooth, you’re likely already aware of how those gaps can affect the look and health of your smile. You have many restoration options available to you, all with specific benefits, but the most tried and true is dentures. As the typically least expensive tooth replacement choice, dentures in Louisville can help you regain your ability to eat and speak as well as smile with confidence. Gaps in your smile can affect more than just your smile’s appearance. In fact, missing multiple teeth and not replacing them can impact your oral and overall health. For instance, fewer teeth in your mouth could cause you to chew your food insufficiently, which can lead to indigestion. Also, any remaining healthy teeth can shift to compensate for the missing teeth, potentially causing misalignment in your bite, jaw pain, and more tooth loss in the future. They look natural. 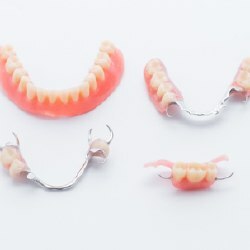 Advances in materials and techniques mean that your custom-made dentures can be truly unique and appear completely natural. They restore function. With dentures, you can bite, chew, speak, and smile the way you used to. They are more comfortable than ever before. 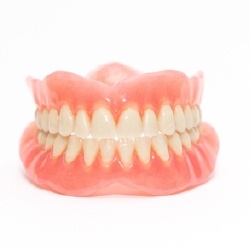 With dentures made specifically to fit you, they should feel comfortable. They are typically removeable. If you get only dentures, you can easily remove them for cleaning and overnight storage. Because your mouth is unique, there isn’t just one option to fit everyone. At Bell Dental, we offer three types of dentures to meet various needs: partial, full, and implant-retained. Our experienced, knowledgeable dentists can help you determine which type is most suited for your situation. Partial dentures are a great option to replace multiple teeth, even if they aren’t consecutive or near each other in the mouth. If you still have healthy teeth, partials can help you preserve what you have and restore what you’re missing. This type of oral appliance is usually secured with a metal clasp. If you’re missing the entire arch of teeth, full dentures may be your best restoration option. Even though you have no more natural teeth, you still need to take care of your oral health. Removeable full dentures can be easily cleaned and stored overnight, and your gums still need to be protected from harmful bacteria. For added security and improved oral health in the long run, you could opt to have dental implants placed underneath the gumline and have your dentures attached to these posts. Implants bond to and strengthen the jaw bone, creating a firm foundation for your partial or full dentures. Because every case is different, the cost of dentures will vary for each patient. After all, treatment can vary from small partial dentures to more complex implant-retained dentures. However, our staff members are experts at helping you understand your insurance benefits and making the procedure affordable for you. In addition, our Louisville office works with third-party financiers that offer low- or no-interest payment plans so that you can enjoy all the benefits of dentures while staying within your budget. Our team in Louisville is committed to providing you with the best quality dental care. To learn more about your restoration options and get started with dentures, contact us for an appointment today!